Entering the Grant Museum is like walking into a laboratory with all the specimen jars, glass cabinets, and skeletons. But what's really great is that you're allowed to be there! It's not very big so allow just an hour for a visit. You'll see some freaky stuff including a dugong skeleton (now extinct), an elephant bird egg (also now extinct), and a mammoth tusk which is at least 12,000 years old. For a small fee, you can become a Friend of the Museum which has the added benefit of adopting a specimen in the museum. You get your name displayed next to your chosen specimen which could make a really great present or surprise for a visitor. Find out more about supporting the Grant Museum. 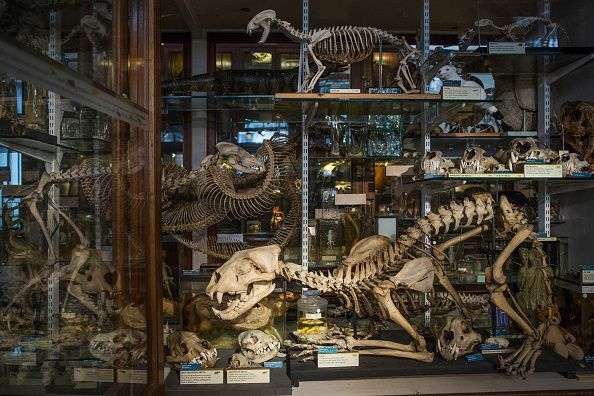 The Grant Museum of Zoology and Comparative Anatomy was established in 1827 by Robert Edmond Grant (1793-1874) to serve as a teaching collection at the newly founded University of London (later University College London). Grant was the first professor of Zoology and Comparative Anatomy in England. He was a mentor to Charles Darwin and he was one of the first people to teach evolutionary ideas in England. It's fun to visit regularly as there are 'Objects of the Month' chosen by the curators which are fun to search for. This is London at its best: quirky, eccentric, a bit spooky, but a lot of fun. The Grant Museum is near to the Petrie Museum of Egyptian Archaeology and ten minutes walk from the British Museum.